Through the centuries, women and some men have been searching for the ultimate contraceptive. Many different methods have been tried and many have failed. Some have been painful or comfortable and others ineffective and others effective. However, finally there is a new Australian-developed contraceptive jab for men, taken four times a year, which has been proven to be just as effective as birth-control pills for women. Sydney researchers found that the hormonal injection is a quick and reliable method of contraception for up to 95 per cent of males. Pharmaceutical companies have shown little interest in making it available to the public. Oh yes, I can see a huge dent in profits if the male jab was to take off. Let's see one jab every 3 months or a packet of pills every month. The injection works by suppressing sperm output in the same way a vasectomy does but it's obviously not a permanent solution. The World Health Organisation is understood to be planning an international study to test a three-monthly injection for men. Countries such as China and India, where population growth is exploding, are expected to be among the biggest markets for the new jab. Can you see this taking off? I asked a few of friends what they thought and one female said, "it would be great but, no, I wouldn't trust them to do it", and another said " I would have to personally take him to the doctor to make sure he had the injection". Another said, " it's perfect for me because the pill makes me ill and my boyfriend would be willing to get injections". A male friend said, "it's disturbing that this drug is not being supported. Men have no reproductive rights. All reproductive rights are held by women in our society, bring it on". More effective methods have got to be a good thing. It allows male and females to take control as they see fit. I agree, bring it on. What do you think? 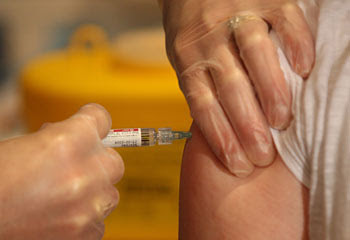 Do you think the male contraceptive injection will take off? Hi lilly. I don't really know if it will take of or not. Being a man I'd be perfectly willing to give it a try. I do think it's a great idea. The pills don't take kindly to me, so I have stopped using them. I would love for my husband to be able to take shots a few times a year, provided of course they are safe. This new shot seems similar to the depo prevara (sp?) shot for women, but I know from plenty of friends, how horrible the side effects are. I agree also that the companies would be less willing to bring this on the market, do to possible profit loss, which is really a shame. Their goal should be about providing people with safe, reliable methods, and medications. Not just about how much money they will rake in. It really makes you wonder what kind of society we live in when the chief concern is about money, and not the people. No, and here is why. (Lilly, I hope you know I speak in general terms here, not in personal terms) Unfortunately, men will be, in large part, unable to accept the "jab" as the SOLE method of contraception because they still feel that they are, and should be, in "control" of any relationship, whether it be dating, engaged or married. Most men still want to be the provider, protector and breadwinner of the relationship and by taking on the responsibility of birth control (obviously, mostly always a female responsibilty in the past)they would be taking on a role which they fear would be "feminine" in the eyes of the rest of the male world. Unfortunately, the opposite should be true, that they would be taking on an even bigger role in the relationship by controlling the method of birth control, but I am just stating what I believe to be the way men will view it. I think it will probably not see worldwide acceptance for this reason. Also, I would be very interested in hearing female viewpoints on this issue because many women also feel the male should have the provider and protector role in the relationship while they retain the "stabilizer" and nurturer" roles. Ladies? @ Jon - Thanks for visiting. Willingness is all thats needed. Least it gives people a choice I guess. @ Michele - thanks for dropping by. Yes I think in those case where women have hassles with the pill then it would be a great idea if their partner was willing to take the jab instead. Thats onteresting aobut the side effects as they werent mentioned..
@ Matt - good points you raise there Matt and I think you may be right. At the least it would give people an opportunity to choose the right method for them. I think if it was financially more attractive then more couples maybe willing to try. I guess though that unless there is public demand it isnt going to go anywhere because the drug companies are not interested in the least it seems. Boy, you raise some good ones Lilly. I was pleased to see the thought everyone put into this. In terms of it affecting men's masculinity...I think it could go either way. I've known men who didn't even flinch at a vasectomy and others who felt terrified of losing there "macho" so to speak. well, gee. would i go for the jab? it all depends where they plan to stick that needle...yikes! This is wonderful. I hope it hits the USA! April - guess at the end of the day it will be up to the pharmaceutical comapnies, lets hope so..thanks for stopping by.